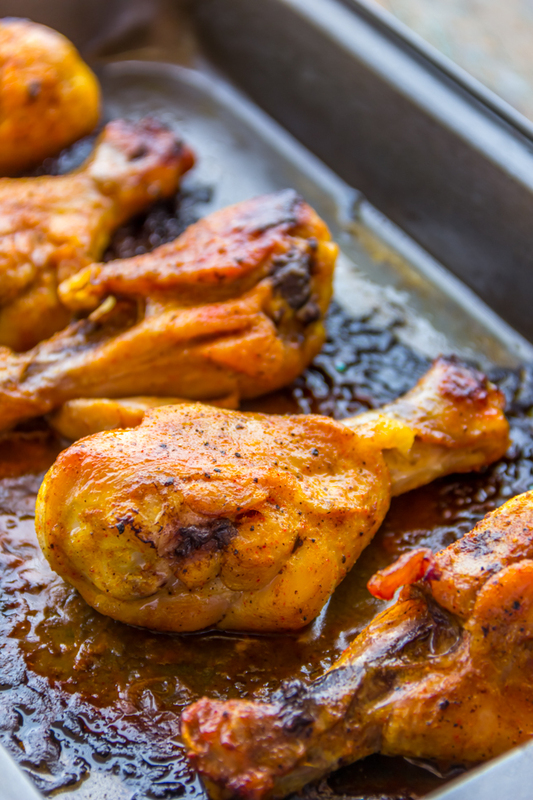 Thai baked chicken is the perfect mid-week meal which is full of flavors from the aromatic Thai cuisine and gets ready in straight 45 minutes with only 10 minutes of prep work! If you love Thai food, then you will just be blown out by this easy Thai baked chicken. This was so freaking good that I regretted not making a large batch. Since I have already warned you, you don’t make the same mistake as I did; make a large batch and freeze them. Then you can have Thai baked chicken whenever you want to and your oven will do all the work for you. Thai food is usually on the spicier side but this Thai baked chicken is nicely flavored with coconut milk which is somewhat sweet in taste and thus gives an incredible sweet and spicy bite to the chicken. This recipe needs a very meager list of ingredients; if you have a can of coconut milk in your pantry, you can make it any time as rest of the things are all pantry essentials. My love for Thai food is a very recent discovery. I was very accustomed to Chinese food which is quite popular in the city I grew up in. I think Thai food takes the whole aroma business a notch up! I feel that the unbelievable blend of sweet, spicy and tangy tastes in a single dish opens up all your senses. Once you master the art of striking the right balance of these three major taste categories, you would become a pro in Thai cooking. One essential ingredient in Thai food is coconut milk. Coconut is a regular ingredient used in many typical Indian dishes but coconut milk is a new entrant. Since the time I have discovered the effect of coconut milk, it has become a magic ingredient to me which is why I always keep it handy. It goes really well with soups as well as many curries. This Thai baked chicken is the very first instance where I tried coconut milk for baked chicken. I was really surprised to see how the flavor of coconut milk had clinged to the chicken even after baking. This sweet coconut milk mixed with the cayenne pepper adds that extra kick which makes it a one-of-its-kind dish. Do try it; you will love me for it! And here is a huge T-H-A-N-K-S to RASAMALAYSIA for this wonderful recipe! Preheat your oven to 190 C / 375 F and arrange the rack at lower third of your oven. 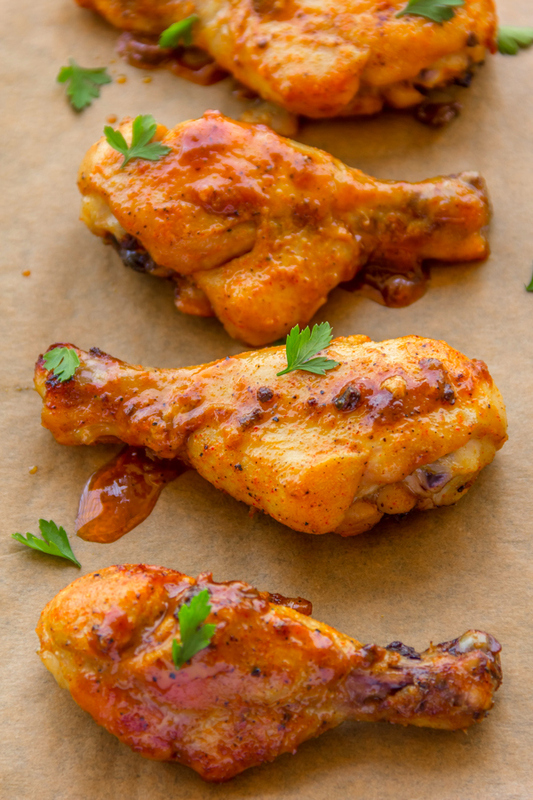 Rinse and pat dry the chicken drumsticks. Mix all the ingredients listed under marinade in a bowl and whisk them well to form a pale yellow mixture of quite runny consistency. Add the coriander stems and minced garlic to the chicken drumsticks and rub with your hand making sure the chicken gets a good amount of the aromatics. Next add the marinade to the chicken, mix to coat well and marinate for 30 minutes or two hours if you have time. 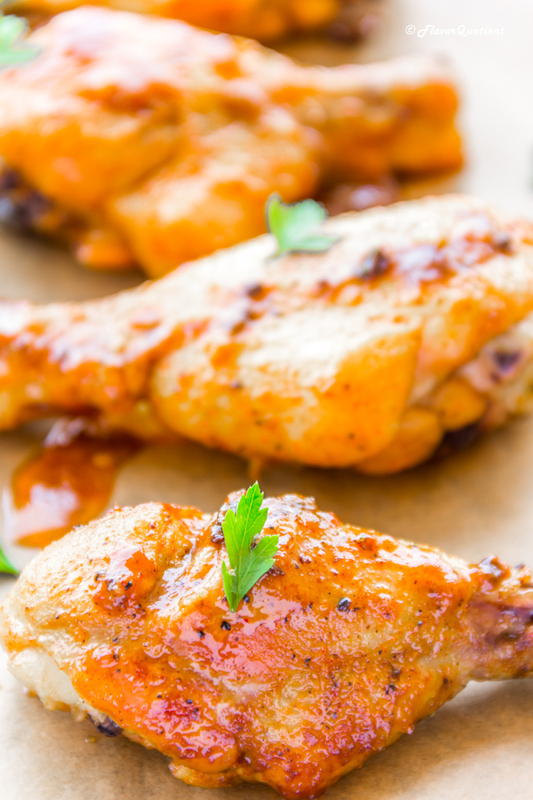 Longer you marinade, tastier will be the chicken. 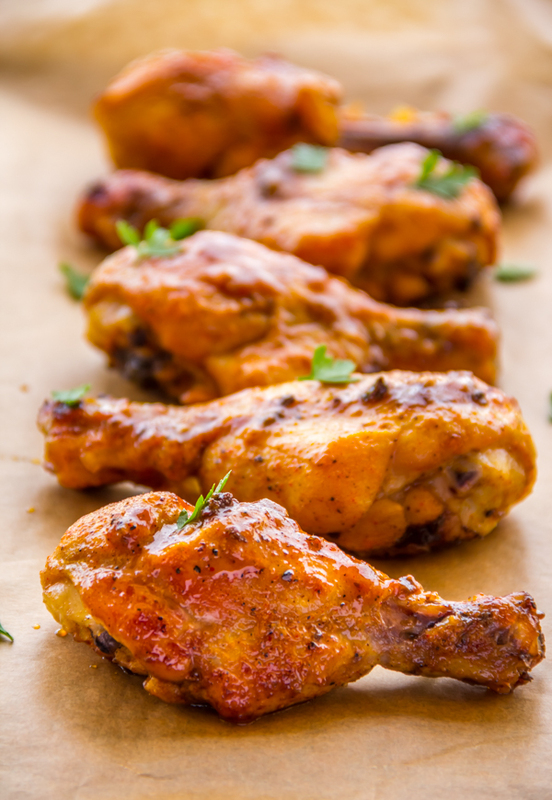 Arrange the chicken on a baking sheet lined with parchment paper and bake for 40 minutes or until the chicken is cooked through. You can check with a meat thermometer if the internal temperature has reached to 165 F, then it is fully cooked. Garnish with chopped coriander leaves and serve immediately with Thai sweet chili sauce. I love using coconut milk when preparing chicken. 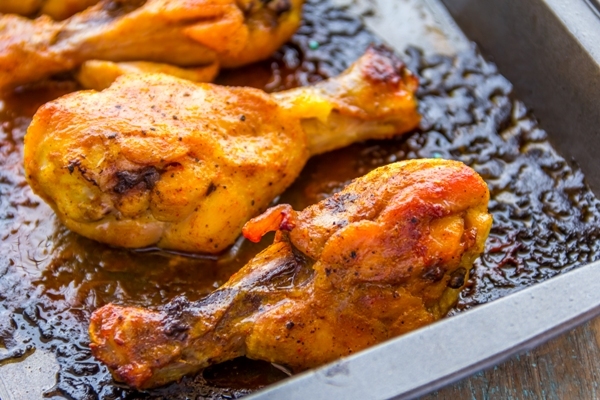 Thai baked chicken sounds fancy and full of flavors. I’ve noted down the recipe to try it the next time I decide to make a chicken dish. Yes! I too love coconut milk for its distinctive taste and flavor. Do try it and let me know how it turned out! Thanks for stopping by! This looks like great recipe. I *love* Thai food too! Pinning to try this. Thanks! Thai food is my favorite too!